Another question. Did you know that when guinea pigs get excited they make a high-pitched whistling noise? When my friend Arva from I Live in a Frying Pan asked me to be a guinea pig for her embryonic food tours and I nearly ran round going ‘wheeeb, wheeb, wheeb’ with excitement. Poor girl, I was so enthusiastic that I browbeat her into arranging it to coincide with my sister’s visit to Dubai. Bur Dubai is not known for its plethora of parking spaces so sis and I hopped on the Metro. It was the first time I had taken a journey that involved changing lines and took us to the Khalid Bin Al Waleed station which is like Neptune’s palace. It wouldn’t look out of place in Disney’s Little Mermaid – check the pics here. Creative spelling amuses me. Our fabulous Frying Pan food tour leader. AMRITSAR, PUNJAB The six chefs in the kitchen belie the size of this tiny restaurant, Kulcha King, the dining area reached up a flight of rickety stairs. The kulchas are hand-rolled and baked to order. While a paratha is fried (usually in ghee) these aloo kulchas are breads filled with potato then fired in the oven. For me, they beat their fried cousins hands down. 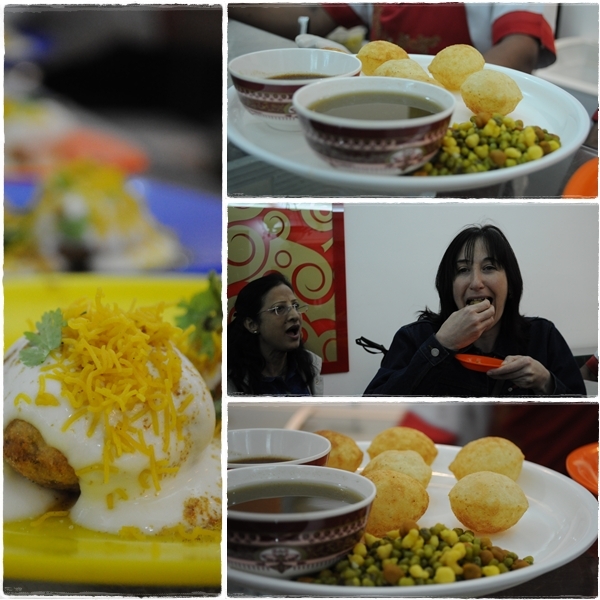 We ate them with chana masala (chickpea gravy), sweet chutney and drank cool meethi lassi (sweet yoghurt drink). GUJARAT Not just the discovery of a new dish but an initiation into a whole new ritual. Rangoli is, apparently, extremely famous for pani puri. These are delicate little balls, hollow with a thin, crispy shell. The chef makes a small hole in the top and carefully adds a mixture of sprouts and pours in something that was described as spicy water. The trick is to eat it as quickly as it is filled (or the shell will go soggy) and pop it into your mouth in one go. Arva’s Mum coached us from the sidelines, telling us exactly what to do. We also tasted dhokla (yellow gram flour cake) with tamarind chutney on top and dahi puri (which were moreish yoghurt and tamarind sauce covered puris). Don’t be fooled by our expressions. These were delicious – a unique eating experience! The pani puri are just a little bit bigger than you can comfortably fit into your mouth. As soon as you crunch them, the spicy, sour, sweetish, tangy liquid spreads over your tongue and you want to swallow immediately but you can’t because you have to chew the fresh, crunchy sprouts and the crispy layer. It’s an eye-watering experience but strangely addictive. Indeed they have pani puri eating competitions where champions can eat twenty in one minute. RAJASTHAN How the other half live! The sign on the wall outside the restaurant shows a glimpse of bachelor life. You can have two hot meals a day for 450 AED (£78 $122). Inside the clean and comfortable Karani restaurant we ate ground wheat which is formed into balls (given a slight sweetness with jaggery). You break them open and dip them into delicious savoury dhal, hence called daal bhati churma. PUNJAB After a short wander through the streets of an area known colloquially as Meena Bazaar, a place that was even more brightly-lit than the others (quite a feat) lured us to its doors, Sind Punjab. Chicken tikka is practically a national British dish these days but this was the real deal. 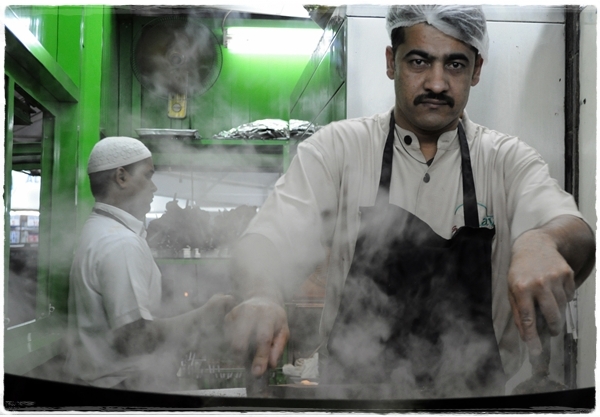 It was the job of the chicken tikka man in his special room to grill the chicken to melting perfection over coals. We ate ours with our fingers while being eyed by hungry passersby. 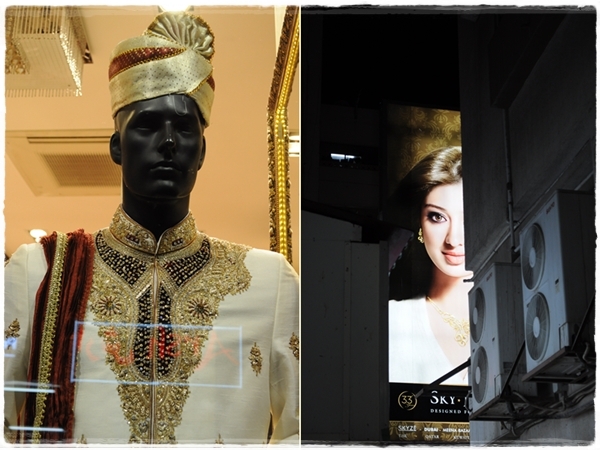 GUJARAT/RAJASTHAN We really needed Arva’s excellent guidance to find Rajdhani tucked away down a dark back street. The sign in the window showed that it was worth seeking out as 987,725 thalis had been served to date. This is a restaurant for the indecisive vegetarian – vegetable thali is the only thing on the menu (apart from desserts) and is displayed in the window. We weren’t here for thali though. A man with a trolley made his way through the lively tables of families and began a careful ritual. He was Merlin or perhaps Professor Snape in the Potions lab, lighting charcoal, drawing liquids, mixing brightly coloured powders. We were under a spell, transfixed. Smoked chaas is made by burning spices over charcoal, upending a cup over the smoke then quickly filling it with a thin yoghurt before stirring in a variety of fresh herbs and more spices. Sour, smokey, spicy and rich – it was the strangest drink I have ever tasted. NEPAL My first encounter with momos (how I became a momo-eating expert to follow soon) by hopping over the border of India courtesy of the Yak n Yeti (name plaguerised from the original in Kathamandu). 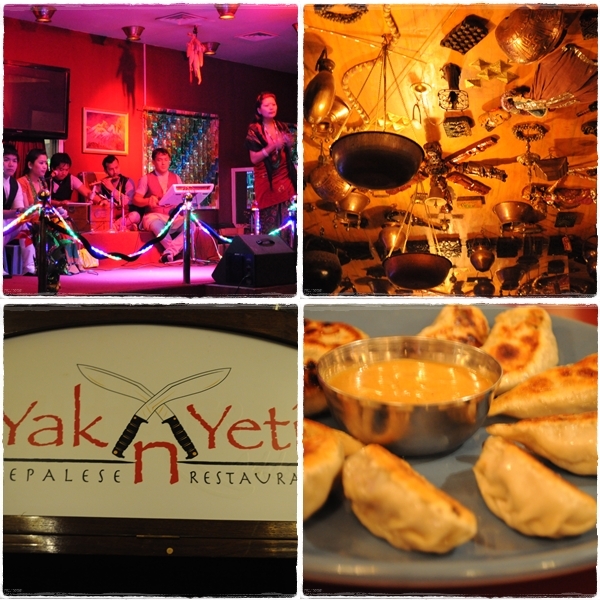 The traditional Nepalese entertainment completely drowned out the manager’s explanation of the chicken and vegetable momos but they were kothey-style (i.e. steamed and then pan-fried) with a lightly spiced dipping sauce. BANGALORE Could anything else pass our lips? 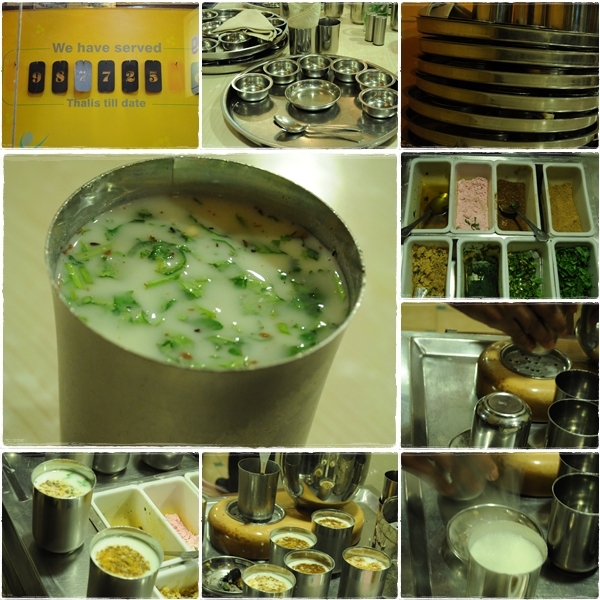 Only something cold, creamy and sweet supplied by Sreeraj Lassi, famous for traditionally-made lassi (see pic) and homemade kulfi. The latter came in the sweetest little earthenware pots (called matka) and with cashew nuts (kaju) or saffron (kesar) hence matka kesar kulfi and matka kaju kulfi. During a longer stretch of walking, I picked up some freshly made bread from a hole-in-the-wall Yemeni bakery (the bakers didn’t want to show their faces in the pics). Arva pointed out this little gem and her knowledge and research of the restaurants and their specialities is encyclopedic, driven by her genuine passion for street food, ethnic eateries and authentic cooking. She’s modest as well so will blush when she reads this bit! So who wants to be a guinea pig again? Me, me, me. I’d only just begun my ethnic food Odyssey and Arva translated my inane grin as consent to invite me to a food tour of the Middle East, in Deira. That was for another day though; sis and I waddled back to the Metro weary but replete. It was the highlight of her visit to Dubai, she sighed happily. Frying Pan Food Adventures will officially commence sometime this Autumn so get yourself in line here and keep in touch via Facebook and Twitter. Have you been on a food tour elsewhere in the world? Sensational account, Sally and wonderful pictures. I love the facial expressions – you know which picture I mean – fantastic! I’m so glad Raji took those pics – not the most flattering, but it shows what an assault on the senses this was! What gorgeous food! Thanks for sharing. Thanks Rosa – you are so kind to leave a comment. “I’ve lived in the UAE for 12 years”, a sad indictment of expats. What a lovely post. That first picture took my breath away. Great job! I liked his expression too Connie. I’m salivating only of the thought for all these tasty things you’ve tried. It was such a brilliant experience. Come and visit – we can taste together! Yay, Sind Punjab’s on the list – woohoo! I can’t tell you how much I enjoyed this post. I felt like I was right there with you. I lived in Abu Dhabi in the 70s and Bahrain in the 80s and regularly did just what you did here, though for me it was visiting and revisiting much-loved favorites. This was just a great post! Really glad you enjoyed it. I used to visit this part of Dubai often when I first arrived but as the city has changed go less and less. It was a trip down memory lane for me too although not as dramatic as life in the 70s. Your post made me relive the whole amazing experience. It was such a fun tour, glad I joined with you all. Amazing pics Sally. 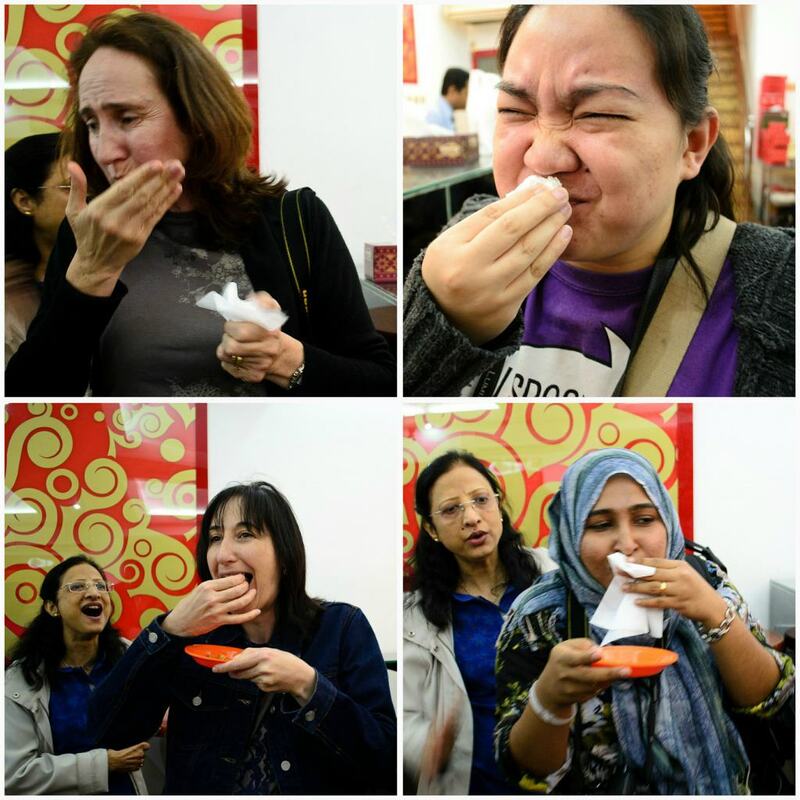 Thank you so much for the pics of us eating pani puri Raji – much, much appreciated. It was such fun to do the tour with you. Amazing pics of the frowning faces… an amazing post. Hilarious too! Honestly, was this the most whacky food experience you had? Specially the Pani pooris??? Yes pretty whacky Ishita – although the Yemeni tent in my next post was also a revelation. I am embarrassed to say that we did this in February. It was such an amazing experience that I had to find time to write it properly to do it justice. My soppy heart has puffed up with happiness and pride that you enjoyed the tour…but more importantly, came away with memories of what you ate! You were the pioneer of the Frying Pan Test Tour with your idea to take your sister out – best idea EVER – and I won’t let you believe anything else. Love the review Sally, you’ve made me feel super special today. Thank you. And may there be many more tours and fun foodie experiences with you to come! You are super special Arva. As you know this was the highlight of my sister’s holiday. 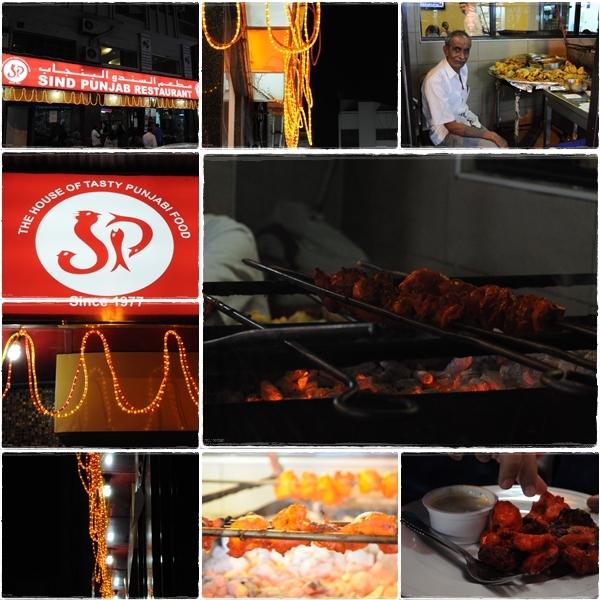 Always a revelatory and enjoyable experience discovering new food delights with you. I am extremely envious!! You ladies are so lucky! I blame not-checking-facebook-so-often for not being with you on this! Thanks – I have to say I talked Arva into this! It would be great fun to do this sort of tour with you. Yes an entire month – and this city is getting more and more expensive to live in so I must say I’m tempted myself! Wonderful post and educational for some of us who take things and food for granted. I am unfortunate to miss out on most of the things Arva does for reasons best know to her (either I am too busy to be bothered or too tired from my days job to be taken out on her tours). Your review sure will open a few eyes and will also help Arva launch her Food Tours soon. Thanks Didi – I should have linked to this…it happened such a long time ago I couldn’t remember who had written about it. Always fun when you are around. Wonderful post, I have not even heard of few of these places….cant wait to check them out!! I would love to join in on the next outing! The best thing is to put your name down on Arva’s site http://www.iliveinafryingpan.com/food-tour-dubai/ I think people will be queuing up once she launches the business in the Autumn. Highly recommended. What a delightful post Sally. Enjoyed taking this food tour with you and Arva. Kudos to Arva for doing something that she is so passionate about. Hope to visit Dubai soon and hop on to one of these lovely food tours. It would be so good to meet you Anita. Do get in touch when you are coming. She is indeed – we should give her a crown. Great post Sally – Sounds like a fun tour. And well done Arva! I’d love to try this some day. Arva- You are truly amazing with your precise write-ups. Pramod uncle, that is so incredibly kind of you, and I LOVE that URL! hahahhahaa…thank you so much for the positive response, can’t wait to take you and aunty on a tour & repay all the lovely Delhi eats you made me try when you’re down in Dubai. Thank you for your extremely kind comment Pramod. Fantastic post and photos. Thanks for taking us along with you. 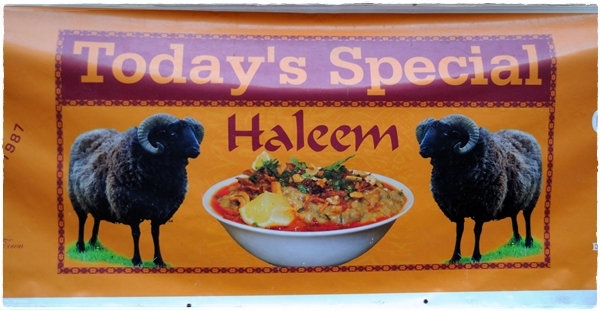 I was gutted to have missed this one – but at least we managed Deira’s ethnic eats. Long live the Frying Pan – your idea is fabulous and will do very well. These hidden gems need you! Can’t wait for the launch and any guinea pig requirements beforehand! This was so interesting!! I think I am going to use some of this info for my Friday Food Quiz! Oh yes do – what a good idea. You think you know about food and then a whole new chapter opens up. You never stop learning. Sally, A lovely write up! I am glad I too was one of the guinea pigs of the first ‘I live in the Frying pan tour’. It was great meeting so many food lovers & bloggers for the first time. I enjoyed touring, eating and watching each one trying to absorb the information Arva was churning out besides tasting the dishes she had selected. I pray to God that her hard work pays off and she is successful in this venture of hers! Thank you & all the Best to you Sally and all the food bloggers who think so highly of her. It was such a pleasure to meet you – and thanks for your invaluable coaching on eating pani puris, it added something extra to the whole tour. What an adventure! Getting to visit so many places all in one go… Sounds like my kind of meal, as I love tapas because you can taste a whole bunch of dishes. Thanks for the readable treat, stopping by from PotMC! I share your love of tapas – lots of tasty morsels – especially like Spanish snails. Love the account! 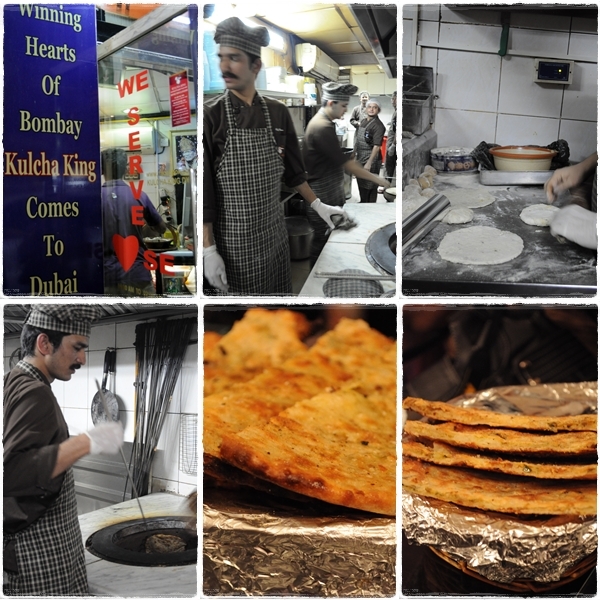 I need to try Kulcha King soon… and Sind Punjab is just awesome, I agree! Kulcha King was brilliant. I thought that I loved the parathas from Ravis but they were kicked into second place that night. An amazing insight on the North Indian food available …who would ever imagine the food options just doesn’t end. 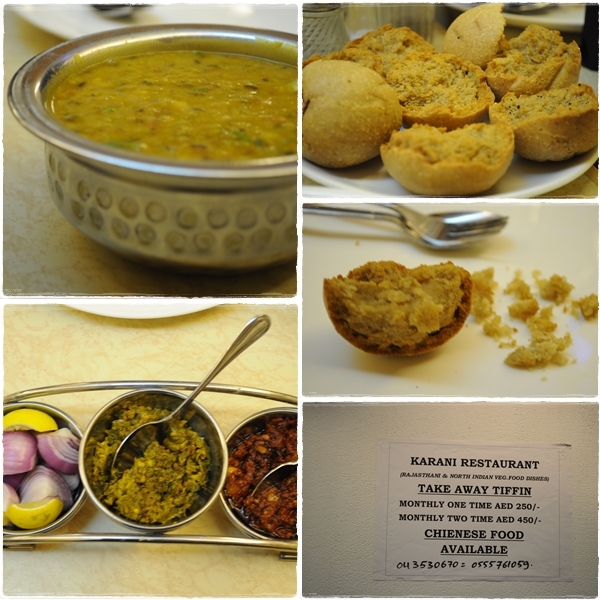 hope your’ll enjoyed having the Pani puris….. This takes me back to that wonderful tour…It would be hard to pick out what was the best food or restaurant, as they all had their particular charms (that dhal..those kulchas…!). What really made it was being on the tour and being ‘coached’ through it. I would never have been the same just going there alone, without being told that it was ok to slurp my lasi (polite infact! ), and what on earth to do with a pani puri. This really made it special and fun, and the fact that we were all novices together! This really was one of my most memorable times in Dubai. You being there made it extra special for me. Aww just saw this comment…such generous words. If not for you crasterkipper, this ‘test tour’ wouldn’t have happened. Thank YOU. Thank you Jane. I love the richness of the English language too. I’ve never been to India but I have made friends with an Indian girl here in Australia and she came to my house yesterday to show me how to cook some of her foods from her region. We will be eating them tonight and looking at all your gorgeous photos has made my stomach rumble! Oh my goodness… What a sampling! Our neighbors across the street are from southern India and are much too generous with their samples, but strangely, I am never satisfied. Always leaves me wanting more. What a time you must have had with your sister! we have a best North India Tour Packages. ,that will be very helpful for India tour.